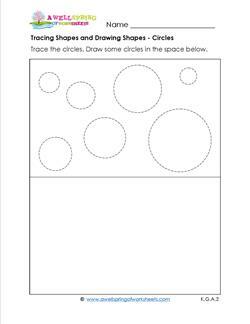 These basic shapes worksheets are simple but perfect for introducing the shapes. 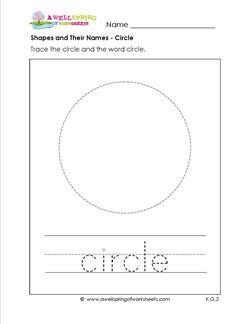 Every worksheet has the shapes and their names in dashed lines. Kids simply trace the shape and the shape name. Then they can color the shapes if they want to. For even more practice have kids trace the shape and it’s name in at least five rainbow colors. The five main shapes the Common Core requires for kindergarten are included as well as 7 others for more challenge and fun. 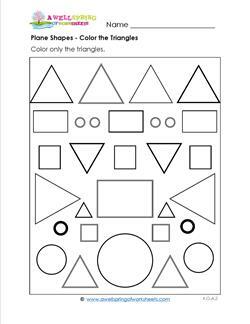 12 shapes and their names geometry worksheets. 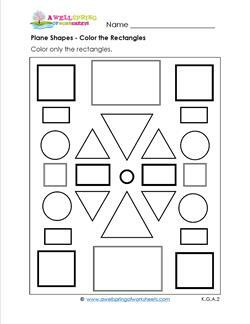 Need some shape cards to post on your walls for kids to reference and recite? Well, here you go! Each of these plane shapes comes in three different styles: black and white, color, and color with a cheerful smiley face. Each has the name of the shape directly underneath it. I have included 12 basic shapes in this section: circle, diamond, heptagon (admittedly, this one is a bit out of the ordinary), hexagon, octagon, oval, parallelogram, pentagon, rectangle, square, trapezoid, and triangle. Plane shapes are “flat shapes” in two dimensions. If we look hard enough we can see these shapes all around us! 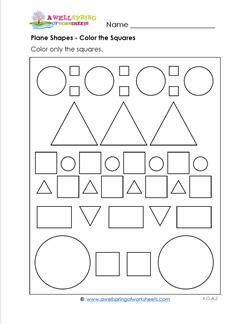 Our shapes worksheets help your students identify and describe shapes and their attributes – the number of sides and corners (or vertices) – while practicing their small motor skills of drawing, coloring, and cutting. 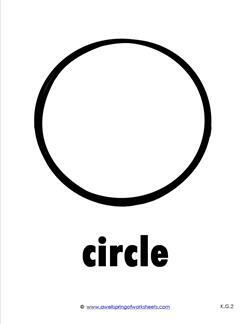 Besides using worksheets, ask your kids to look for these shapes in the environment around them, starting with the classroom. What they come up with just may surprise you! Many things can be made out of shapes, including animals. 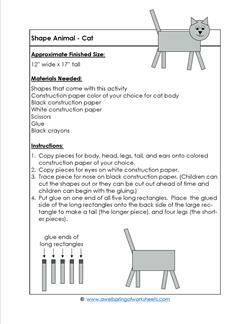 When kids construct these shape animals be sure to have them tell you the names of the shapes they are putting together! And don’t forget that they are plane shapes (flat shapes), not three dimensional shapes. For an added dimension (get the pun!) have kids make the sounds of the animals. Now that’s fun! It is suggested that you use construction paper for these projects. You’ll also need scissors and glue. Check each instruction page for the needed supplies ahead of time. Thanks for stopping by our square worksheets page! 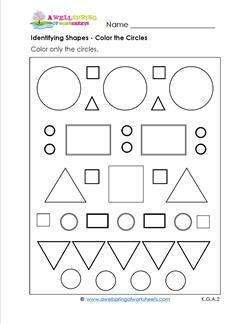 You will find square plane shape worksheets for your classroom that touch on identifying, matching, drawing, and coloring squares. Have kids look at the squares and tell you about the lengths of the sides and how squares differ from rectangles. What happens to how a square looks when you turn it around and put it on different sides? 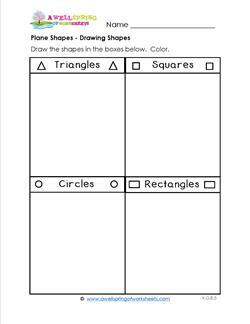 Kids can pair up and look around the room, pick out the squares, and draw them on one of the worksheets.